Modern contemporary white panel styling . Six recessed panels are arranged in an ascending stepped configuration, solid borders. For all internal areas: dining room, living room, kitchen, bedrooms, bathrooms. Particularly suited for Commercial applications. Corridors, offices, meeting rooms. Un-Finished- so ready for decoration. 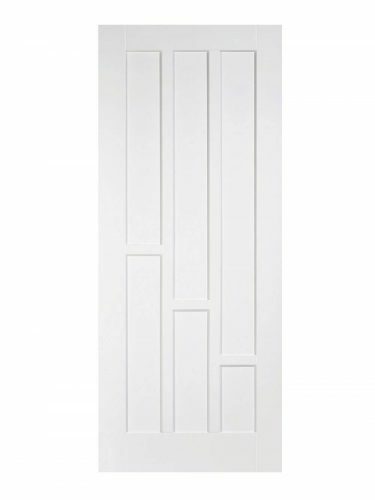 Available as a Fire Door (44mm) version and a 3-light glazed variant. White Coventry. Rectangular inset panels in various lengths give this white Coventry door design in a primed solid core a unique appearance.